This handbook is the standard for all U.S. Forces occupying base camp facilities (e.g., Main Base Camps, Forward Operating Bases and Outposts) in contingency operations where USAREUR has been designated as having Title X responsibility. The intent is to provide personnel with adequate living and working facilities, while being good stewards to taxpayer dollars. This Red Book outlines master planning, housing, unit facilities, utilities, service member support, and facility maintenance standards for all bases. It is essential that commanders at all levels ensure these quality of life standards are met, but not exceeded. 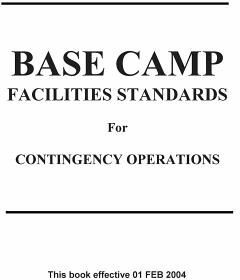 Commanders are responsible for ensuring that all facilities comply with the requirements outlined in the handbook. Exceptions to the Red Book should be routed through the USAREUR Office of the Deputy Chief of Staff, Engineer, to the undersigned for decision.